Use the Survey Designer window to write your survey in any single-byte language such as English, Spanish, French, German, Italian, Portuguese or Dutch. Use the built-in Interviewer to enter new or modify existing respondent data. Use the Data window to edit, import, export, validate and clean the respondent data. Use the 10 analysis wizards to generate frequency tables, cross tabulations, correlation matrices, descriptive statistics, bar charts, pie charts, 3-dimensional area charts, and more. Use the Analysis window to modify the tables and charts generated by the analysis wizards or to create your own custom tables and charts. Use the Batch Report Designer to print and/or export your analysis tables and charts together as one report. Survey Crafter Professional makes designing paper, telephone and web-based surveys a snap. It guides you through creating a wide variety of question types, including closed-end, all-that-apply, rating, open-end, quantity, ranking and constant sum questions. 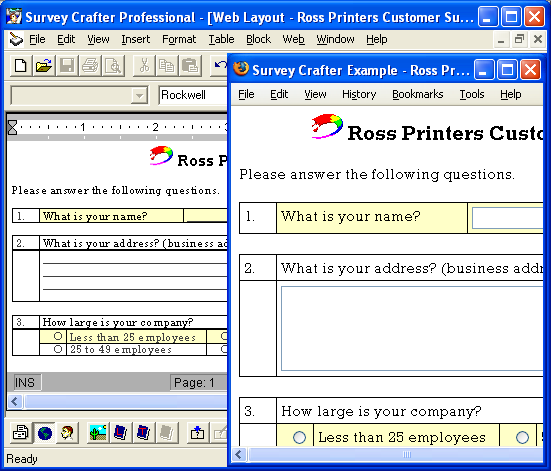 Survey Crafter Professional even comes with a how-to primer on market research that offers tips and techniques on question phrasing and survey layout. You can use the Question Block Layouts toolbar to drag and drop new question blocks into the Survey Designer window. Both the Question Block Layouts toolbar and the Question Block Wizard display a gallery of block layouts that features 156 different block layouts. You can see an example for and read about each block layout in Survey Crafter Professional's online help. To quickly format your question blocks, use the block styles that come with Survey Crafter Professional or use ones that you create yourself. You can create as many survey questionnaires as you like in a single Survey Crafter Professional study and then analyze the respondent data together or separately. For example, you may want to have variations of the same survey or have the survey in more than one language. Survey Crafter Professional comes with American English, British English, Spanish, French, German and Dutch spelling dictionaries. Use Survey Crafter Professional's Web Survey Publish wizard to generate HTML files to put on your web server. Copy the generated HTML files and the Survey Crafter Professional CGI executable (Windows or Linux), ASP PerlScript or CGI Perl script (all platforms including Unix) to your web server and you are ready for your respondents to complete your survey. The Survey Crafter Professional-generated HTML pages need no modifications to work on your website. You are of course free to make changes to the files to further customize the formatting, positioning and layout of the page, if you like. Once your respondents have completed your web survey, you download the data file from your web server and import the contents into Survey Crafter Professional. Use Survey Crafter Professional's analysis wizards to view the results of your survey. Survey Crafter Professional web surveys have been tested on many web server platforms including Red Hat Linux and Microsoft® Windows® 10/8/7/Vista/XP/2000/NT/Me/98/95. Survey Crafter Professional web surveys have also been tested on many web servers including Apache, Microsoft® IIS 4.0-7.5 and Xitami. Use Survey Crafter Professional's built-in Interviewer, an automatically generated data entry form, to enter results live during a telephone survey or from hardcopy responses. Behind the scenes, Survey Crafter Professional checks and verifies your data while building a database that stores it for analysis. Survey Crafter Professional painlessly handles everything related to managing your survey data. Use Survey Crafter Professional's data window to isolate and correct errors in your survey data. For example, Survey Crafter Professional can tell you if a response to a numeric question is outside the range you specified or if responses to a constant sum question do not sum to the total you specified. Survey Crafter Professional has a data error log window that, with a click of a button, has the Survey Crafter Professional data window show only the respondent data that contain errors. In addition to using the built-in validation rules, you can add rules that have Survey Crafter Professional validate responses and show respondents your own warning and error messages. You can also create computed variables that check the integrity of your respondent data. Use the Survey Crafter Professional expression language when creating a computed variable to determine if a respondent's answers to your questionnaire are logical and consistent, for example. Use these computed variables to include or exclude certain respondents from your analysis tables and charts. Survey Crafter Professional's 10 built-in analysis wizards help you quickly and easily analyze your survey data, creating frequency tables, cross tabulations, correlation matrices, descriptive statistics tables, banners, and custom analyses. These are instantly displayed in professional-quality tables and graphs, with Survey Crafter Professional giving you full formatting control so that you can use them in attention-getting reports and presentations. Survey Crafter Professional's analysis spreadsheets are composed of cells and expressions. Use the Survey Crafter Professional expression language to do more analysis on your respondent data. Enter your own expressions using Survey Crafter Professional's Expression Builder. For example, if you want to know how many male respondents over 30 years old said their favorite newspaper is the Boston Globe, enter an expression like "COUNT(Gender='Male' AND Age>30 AND FavoriteNewspaper='BostonGlobe')". Survey Crafter Professional's computed variables help you segment your respondent data. Survey Crafter Professional's computed variables use expressions to automatically calculate their values. Use Survey Crafter Professional to create computed variables that segment your respondent population. Then use your computed variables and Survey Crafter Professional's built-in analysis wizards to generate tables and graphs. A batch report allows you to print and export in one report groups of Survey Crafter Professional tables and charts that analyze the responses to your survey. In addition to including temporary tables that Survey Crafter Professional automatically builds when the report is printed or exported, a batch report can also include analysis tables and charts that you created in your study. Use Survey Crafter Professional's import and export features to transfer all or selected respondent data to and from other software applications like Microsoft® Excel, Microsoft® Word or Microsoft® Access. Copy Survey Crafter Professional's analysis outputs to software applications like Microsoft® Excel, Microsoft® Word, and Microsoft® PowerPoint to add to your reports and presentations. You can also export Survey Crafter Professional analysis tables to new Microsoft® Excel 97 Workbooks. Use Survey Crafter Professional's analysis table and chart editors to publish	your analysis tables and charts on your website. You can also preview your analysis tables and charts in your web browser. To download the Survey Crafter Professional 5.0 Evaluation, please read the Downloads page. To place an order for a copy of Survey Crafter Professional 5.0, please read the Pricing page or call toll-free 877.650.8527 or e-mail info@surveycrafter.com. For more information, please read the Frequently Asked Questions page or call toll-free 877.650.8527 or 978.635.1717, or e-mail info@surveycrafter.com.